Pond Videos - Algae - by Mark Wilson "The Pond Advisor"
The reason that you get algal blooms in garden ponds. Is because there are too many nutrients in the body of water. Green pond water (lots of single-celled algae make the water green) or growth of blanket weed (filamentous algae – long chains made up of multiple cells of algae) will happen naturally every spring (if the water has lots of waste within it), as the nutrients are released into the water as organic matter breaks down over the winter period. The algae begin to multiply before the water plants start to grow. So the algae will be rapidly forming an algal bloom in one form or another as they freely mop up the dissolved nutrients. Spring algal blooms are usually in the form of green water, thanks to the coloured chlorophyll in these tiny plants. Green water is just mother nature’s way of dealing with the nutrient imbalance in the pond water. Algae (phytoplankton) then becomes food for the more complex creatures (such as zooplankton) its all part of the aquatic food chain. Typically, this imbalance will right itself in most garden and wildlife ponds as the pond plants begin to grow and lock away the nutrients. Then the numbers of zooplankton will quickly increase as they start to chomp down on the densities of algae. In highly stocked fish pools and ponds though, feeding these prize pond fish every day is continuously introducing more nutrients, a balance may be more difficult to achieve without giving nature a hand. Fish faeces and urine release nutrients into your pond, so every time you feed the fish you are adding to the number of nutrients into the water. Koi, in particular, can eat a lot and are messy feeders, so even the waste food will release algae-stimulating nutrients into the water. In most ponds, but especially those designed specifically for koi (koi pools), you will not have enough plants to mop up these nutrients so that green water can be the result any time of the year. Of course, the biological filters commonly used in a fish pond design (or pool) work by both physically removing some waste and by harbouring dense mats of friendly bacteria that digest the waste down into its constituent parts, but these still leave enough nutrients for the algae to increase. If you want to have clear water in a compact koi pool. Then it is essential to install an Ultraviolet Clarifier. A UV (ultraviolet clarifier) is the only guarantee of clear water because the clarifier, kills the algae, significantly reducing their densities. If you are going to go down this route, then you need to have a pump installed in the fish pool to push the water through the clarifier, although most fish ponds and koi pools will already have a pump as the fish need lots of water movement and aeration. Ultraviolet light causes the single-celled algae to clump together. These clumps will sink to the base of the pond so that the submerged filter pump can mechanically remove them. Then they travel up into the filtration system, and this effectively sterilises the water of algae. Ultraviolet Clarifiers come in various sizes and wattages. Basically, the higher the wattage, the more powerful the clarifying effect. You can have a clarifier that is too big or too small for your pond, so it is essential to match the wattage to the pond volume and fish stock, but if you want clear pond water all the time. Then this piece of pond equipment is essential. There is another type of algae, called filamentous algae. As the name suggests, this forms strings of cells that form mats of intertwined filaments that not only look unsightly but can block filters and pumps and stop water circulation in the pond. Once again, filamentous algae will indicate a high nutrient load in the garden pond, and yet it tends to form all season long. Unlike single-celled algae, though it tends to be more difficult to eradicate. The Ultraviolet Clarifiers do not suppress the filamentous algae growth. Altering (reducing) the amount that the fish are fed, reducing the number of fish, or adding more plants are all effective ways of reducing the growth of filamentous algae. We also sell a product called Multi Clear that will clear the pond of algae! The most simple, sympathetic and often the most effective way of controlling algae in a pond is to increase the amount of higher plants. Taller pond plants around the edge of the garden pond could shade some of the water. The reduced light level underwater will inhibit algal growth. Shading is an excellent way of inhabiting algae. When farming ornamental garden pond fish, I did not use UV Clarifiers at all, and we would often cover virtually the whole area of the surface of the water with floating islands to reduce the light levels sufficient to inhibit algal growth. The floating islands would also suspend wetland filtration plants, whose roots grow through the baskets into the water and absorb most of the nutrients. Of course, if you want to see the fish then covering the pond with floating islands might not be the best idea, but including some islands could help matters significantly. The way that I prefer to use plants in a fish pond is to include some rocks and gravel and plant them in these pockets. The rough surface of the stone is the perfect environment for bacteria and attached algae to row, and these two will use up the excess nutrients. It is essential to have enough water flow through the gravel to keep them supplied with oxygen. Otherwise, they will die. Similarly, they cannot become covered with solid waste as this too will kill them. So there are many ways of controlling algae in garden ponds. My favourite is to use more natural methods, particularly a combination like in our eco pond range. 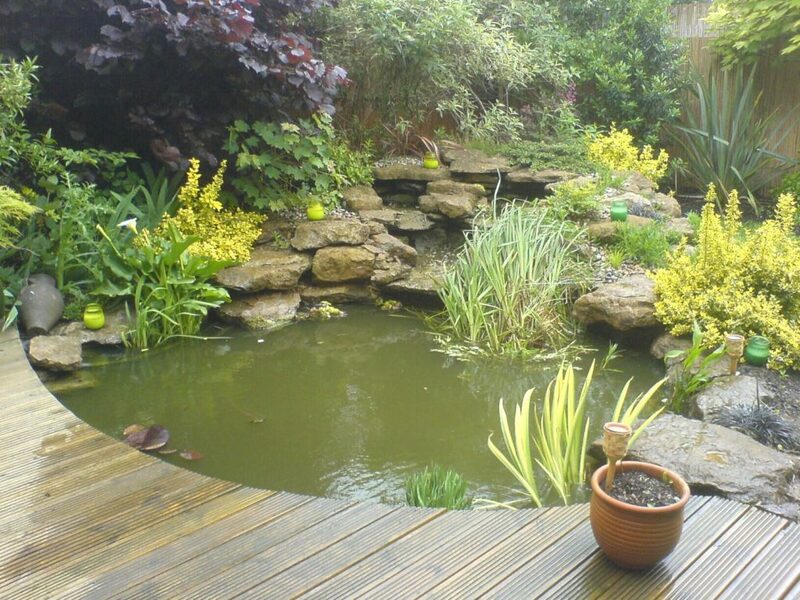 These ponds are designed carefully and have everything a beautiful body of water needs as they have the proper mechanical filters to scrub the water of excess nutrients. Lastly, this page is about pond and water feature videos, the main topic on this page is Algae – Videos come in many forms. Similarly, I have put all my heart and soul into these on a weekly bases. So the first pond video I would like to share is one I film on site in rugby about different Pond Algae Types. Chances are you have found this quick video because you are looking for more details on the different types of algae in a garden pond. Do Pond Snails Eat Algae? In conclusion, I have put together a list below of some of the terms you may have used. What are the types of algae in a pond? Types of algae in a pond. Types of algae in a garden pond? Different types of pond algae. Types of algae in pond water. Types of algae in ponds. Types of pond algae in the UK. Types of fish pond algae. What are the types of algae in garden ponds?